Eliminate grievances, manage your specialized employees and resources, and receive full situational awareness and visibility with ARCOS automated callout and incident management solutions. See how we helped one of our nation’s largest manufacturers save nearly $5 million and thousands of man hours over the next three years. 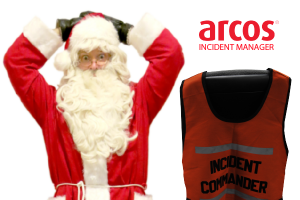 ARCOS Incident Manager is a cloud-based mobile solution designed specifically for quick response to planned and unplanned events and provides a single, convenient platform to plan, respond, restore and report on any type or number of resources. ARCOS can help solve your company’s unique challenges while saving money and helping to deliver improved customer and employee satisfaction through incident templates and continuous improvement processes. When managing your company’s resources, you need to know when and where your employees are working and who’s available to answer the call. Schedules are volatile and can change dramatically based on absences, training requirements, collective bargaining agreements, overtime restrictions, and employee qualifications, just to name a few. ARCOS Automated Callout & Scheduling is a full featured solution for all critical infrastructure companies that need to create and manage shifts to get the right employees to the right jobs, quickly. With safety and security as your number one priority, we help your supervisors get to work – and get off the phone. When shifts need covered, ARCOS helps you get coverage at the push of a button, no matter where your managers are. Employees and supervisors are both empowered by resource visibility. Using the ARCOS Mobile App for Android and iOS, employees can set their availability, update their current status, see who’s in line for the next call and update their contact records so your system is kept clean and up to date automatically. Employees and supervisors also have easy access to their shift statistics, including their acceptance rates and availability percentages. Supervisors can also use the ARCOS Mobile App to view current shifts and see who is filling them, as well as make adjustments and any updates to any schedules and employee statuses right from their phone. For critical infrastructure managers tasked with scheduling many workers to many different shifts, ARCOS automated callout and scheduling solutions help you keep compliant with adherence to any number of collective bargaining agreements. Using ARCOS, managers, foremen and scheduling administrators can schedule and fill shifts that are automatically compliant via phone or text. You are also provided with extensive records of current needs and resource availability. Learn how you can work smarter!